An airplane cruises across a massive full “Worm” Moon over Los Angeles, Calif. in this photo sent to Space.com on March 16, 2014 by photographer Matt Hartman of Shorealone Films. 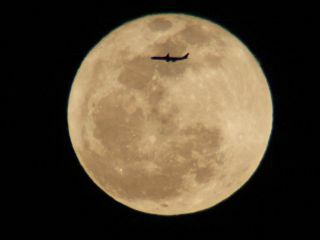 An airplane appears to cruise across the face of the massive full moon on Sunday (March 16) as it shined over Los Angeles in this outstanding photo sent in by California-based photographer Matt Hartman. Hartman, of Shorealone Films, took the amazingly timed image the moon during as it reached its full phase for the month of March. The March full moon is also known as the Full "Worm" Moon. Hundreds of years ago Native American tribes in what is now the northern and eastern United States kept track of the seasons by giving names to each recurring full moon. This moon was also named The Full Sap Moon, marking the time of tapping maple trees. Following their own customs European settlers created some of their own names. Since the lunar ("synodic") month is roughly 29.5 days in length on average, the dates of the full moon shift from year to year.